Watch your step! The Ruins of Abetan are a treacherous labyrinth of steep cliffs and rickety bridges, but the fabulous Khrysos treasure inside is all that matters to the Khrysos Hunters. 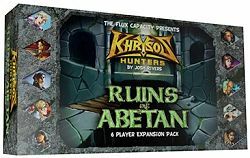 Expand your hunt to up to six players with Khrysos Hunters: Ruins of Abetan Expansion, which includes ten new Hunters to make your team. Jump the gaps, but don't get pushed in!